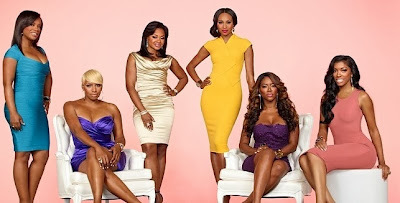 AFRICAN AMERICAN REPORTS: The problem with "black" reality TV is not the shows it's the audience. The problem with "black" reality TV is not the shows it's the audience. You know all the shows. Love & Hip Hop, The Real Housewives of Atlanta, Preachers of L.A, Basketball Wives, etc. While the shows do well in the ratings and are hits for their prospective networks there is a vocal group in the African American community that condemn the negative portrayals of African Americans on these shows. Now I do believe that these shows portray African Americans in a bad light and don't watch any of them. I also will not knock those that do watch them. It's their choice what they watch and enjoy. I know many believe attacking the creators or stars of these shows is helping in the fight for more positive portrayls of African Americans. While I wouldn't say that it doesn't help I would place more on the onus on the viewing audience. I believe that networks only air what sells. The viewers are eating this stuff up and keeping these shows alive. Why? Because negativity, buffoonery, and stupidity sells. I mean my life would make a horrible reality TV show. A black man with a job who is happily married with one child. A black man who owns a home. A black man who serves on his local school board who is actively involved in his childs's life and those of other children. A black man actively involved in his own community The ratings for the George Cook Show would absolutely be in the toilet. There's no drama there so no one would watch. But if people did watch more networks would air more positive portrayals of African Americans. Yeah I know some believe that some networks only want to portray African americans in a negative light. But what those people have to realize is that even more of those same networks want to be profitable. They will air whatever the public responds to. Right now the public is responding to garbage. So who do you think is more responsible for the negativity on realitry shows. The creators or the viewers? Who is more at fault. The creators or the viewers?